One desination for all Motorcycle Repair Needs! At Motorsports Pte Ltd, we do everything differently. You’ll notice our dedication to our customers as soon as you walk in the door. At Motorsports Pte Ltd, we appreciate your patronage. We only employ dedicated people that are knowledgeable in their specific area of interest, whether it is sales, parts, or service. Our employees are motorsports enthusiasts who can’t wait to earn your respect, business, and friendship. You can be assured that every scooter and motorcycle models we bring in, we will also guarantee to have the support with technical knowledge and spare parts. Feel free to check us out and compare for yourself. 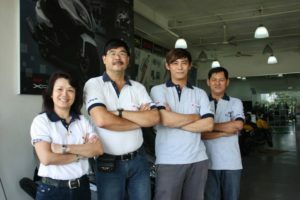 Motor Sport Pte Ltd, a subsidiary of Chong Aik International Pte Ltd (Formally known as Chong Aik Co) was incorporated in 1990. Its primary activities are importing and exporting of motorcycles spare parts, accessories and riding apparel. In 1993 Motor Sport Pte Ltd was appointed as the Sole Distributor for KYMCO’s products in Singapore and Brunei.